Land reclamation has begun to develop a parking area at Hulhule’ in time for the opening of the China-Maldives Friendship Bridge (locally known as Sinamale Bridge). The Sinamale Bridge links the capital Male’ City with Hulhule’, which houses the country’s national airport, Velana International Airport (VIA). 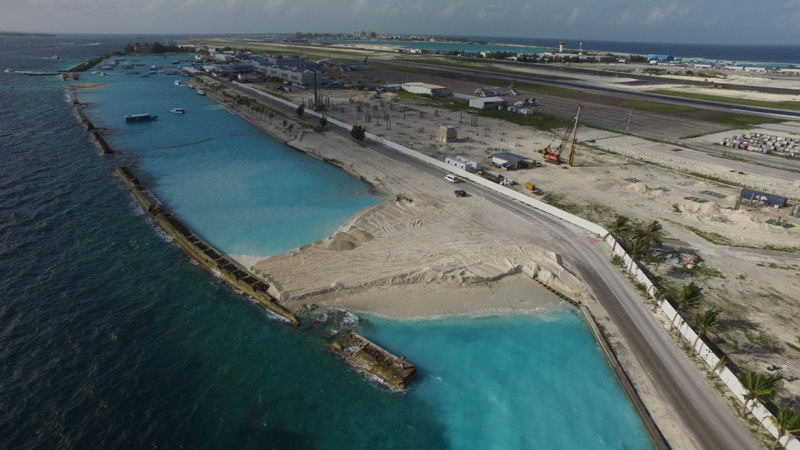 Maldives Airports Company Limited (MACL) has tweeted that land reclamation for the 25,000 square feet needed to develop the parking area has begun. The land reclamation project is undertaken by Dubai company Gulf Cobla, the same company which reclaimed land for the Airport Development Project at VIA. The waterway to the South of Hulhule’ has been shut down for the project, and a new waterway has been built for boats. MACL reported earlier that the company is working on completing the parking area in time for the opening of the bridge. The parking area under construction at Hulhule’ will be able to accommodate over 100 cars and over 300 motorcycles. According to MACL, vehicles which travel over the bridge will be able to travel up to the airport terminal, but will not be allowed to linger in the area.